A drill press provides accuracy, precision, and power you would not be able to get when drilling manually. If you are a woodworker, you must be fully aware of the fact that drill presses is one of the most essential tool to own in the industry. Some users might be saying that having drill presses is not necessarily important to own even if you have your own woodworking shop. However, this tool might be of great help especially with different types of woodworking jobs. If you come to understand the extent of the benefits of the drill presses, you will be able to fully grasp its potential and will surely be happy to purchase one. Because of the accuracy a drill press can perform in any woodworking jobs, it is a wise thing to own, try, and see how it really changes the flow of any woodworking projects. The powerful motor on drill presses can also save the energy of the users because drilling holes without a drill press can be a much more laborious process. When it comes to the functionality of drill presses aside from mentioned earlier as a precision stuff, it has an ability to drill at angles. It is considered as another advantage of drill presses. Creating angled holes can be very much challenging if you are going to do it manually. Especially if you have a lot of projects going on, it could take up so much time and effort for the users. So this kind of function makes a drill press useful in almost any woodworkers’ shop. It also provides safety and security to its users. The variable speed feature of many drill presses gives the woodworkers an opportunity for good command over the drill bit which helps ensure that it does not break easily while being used. If you become familiar with lots of different features of drill presses and know when to maximize them, you are going to appreciate it more and would rather have it in any project you are trying to work on. There are various kinds of drill presses and this particular review will present to you diverse kinds of drill presses for different specific uses for you to be able to enjoy more of y9our woodworking projects more than ever. Dremel is popular manufacturer of rotary tools and is considered to be one of the best there is. This rotary tool is a compact mini drill press kit that can be used as a standalone-handheld rotary tool or as a stationary drill press. When it comes to house drilling, you can absolutely rely on Dremel 220-01 because it can bore surfaces both perpendicular to the bit and even those inclined. This tool can assure you of its versatility which is a great advantage when having one for the business or even for personal use. Having the right tools with you, whether you are working at home or you have your own woodworking business, would probably make all the difference. This tool includes a ½ inch keyed chuck and onboard key storage and operates at 5 different speeds, 740, 1100, 1530, 2100, and 3140 rotations per minute. Although this drill press is small, it really guarantees power enough to drill through metal, wood, plastics, and other materials. This high quality and very affordable tool will not only help you through finishing your works but will also offer convenience all throughout your working hours. So if you are looking for a multi-purpose and compact home drill that has a host of exceptional features and is in the affordable range, this drill press could be a perfect fit for you. This drill press has been popular in the market as one of the best drill presses. It continues its legacy of superior design and for providing precise cuts and affordable price. 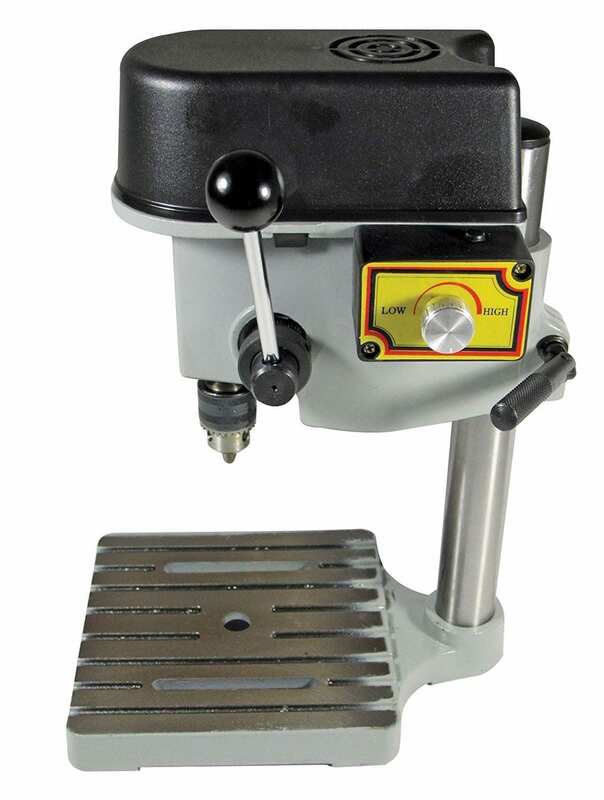 This drill press also comes with a cast iron base or work table to provide adequate support while working. This also ideal for most users who are just new in the field. Having an easy set-up features enables the users to confidently operate the tool without worrying of the probable complications it may cause. For most of drilling duties, having a great drill press is a must for the users. A drill press provides power and accuracy to any woodworking jobs that needs drilling. More often than not, drill presses are the most underrated tools in the industry. What any woodworker should understand is the fact that these tools play a critical role in making sure of the good outcome in any project that you want to produce. This could be a practical way to finish any woodworking task especially when the user learned to maximize the features of one drill press. Most users would not be able to realize how drill presses can really make their job easier and more convenient, but, a lot of users who gave their reviews about their experience with drill presses assures other prospective buyers that these drill presses enables a woodworker to work more quickly than the average. You don’t have to worry anymore about working as quite careful to avoid mistakes because drill presses made it easier for you. When it comes to bigger jobs, you might want a drill press that can sustain the demands of your workload. This will indicate how your drill press is able to stand even the toughest work. Above all else, having a tool that guarantees you a longer life that can do its task at any given point is one vital feature a woodworking really needs for their projects. More than just doing its actual job, a drill press should also be versatile enough to be capable of doing more than just drilling holes. It should also be able to be fitted with other tools, such as a spindle sander or a rotary sanding disc. Above all, the power of a drill press really depends when it can and is already capable of drilling holes into metal. This is very useful feature for woodworkers to complement their needs for their woodworking crafts. It is a fact that if the motor has more horsepower, you can expect the drill will be more powerful. It is an advantage to have a larger motor if you are considering to buy a drill press. Also, it is easier and quicker to drill and it is capable for larger bits usage for bigger jobs. A motor that is more powerful may also last longer and survive more because it does not solely experience difficulties in a specific task. This product is one of the most flexible tool regarded by most users as you can successfully for machining curved surfaces and exposed surfaces. This product features a tool holder that is adjustable and extremely stable, which enables the users to perform any task at any given point without experiencing difficulties. When it comes to compatibility, you don’t have to worry as the Dremel 220-01 has been found to work with different accessories, even though they have not been manufactured by Dremel. Aside from these commended insights, there are also, of course, some critiques that have been stated with regards to the product. Some users noted that Dremel 220-01 isn’t the most reliable option when it comes to milling and the instruction manual isn’t particularly straightforward which makes it not suitable for beginners in the industry. Different tasks may also require the drill bit to spin at different rates, so when you use any drill press, you have to pay attention with different speed rates. This particular model offers various speed rates that is indicated at the rotations per minute of the product. It is important to have this kind of tool to enable the user to work consistently and conveniently without hassle. The Dremel 220-01 was well-liked by many users, especially those who are just establishing their own woodworking shops, because of its easy set-up feature. Whether you are sanding parts or working on stones and other solid objects, you will appreciate how the Dremel 220-01 drill press can be used automatically by just following the basic instructions. It was built primarily for the comfort of the users and to be able to fully use the featured benefits that easily. The Dremel Work Station will make you accomplish special projects without having to invest in a variety of separate tools and attachments. This is easily a go-to machine if you want to work on something in the household and deliver great results even if you are not fully knowledgeable with the exact usage of the machine. Because of its impressive operation, most users found themselves looking for a drill press exactly like the Dremel 220-01 in the market. It is one of the most flexible in the line. Once you purchase the product, you will be surprised how you can add such a handy device to your workbench for such low cost. However, to fully enjoy the capabilities of this tool, you must also know its limitations for you to prepare for what’s to come in another project. Overall, this drill press can be a great recommendation for future users you are starting on building their own woodworking shop or furniture shop. 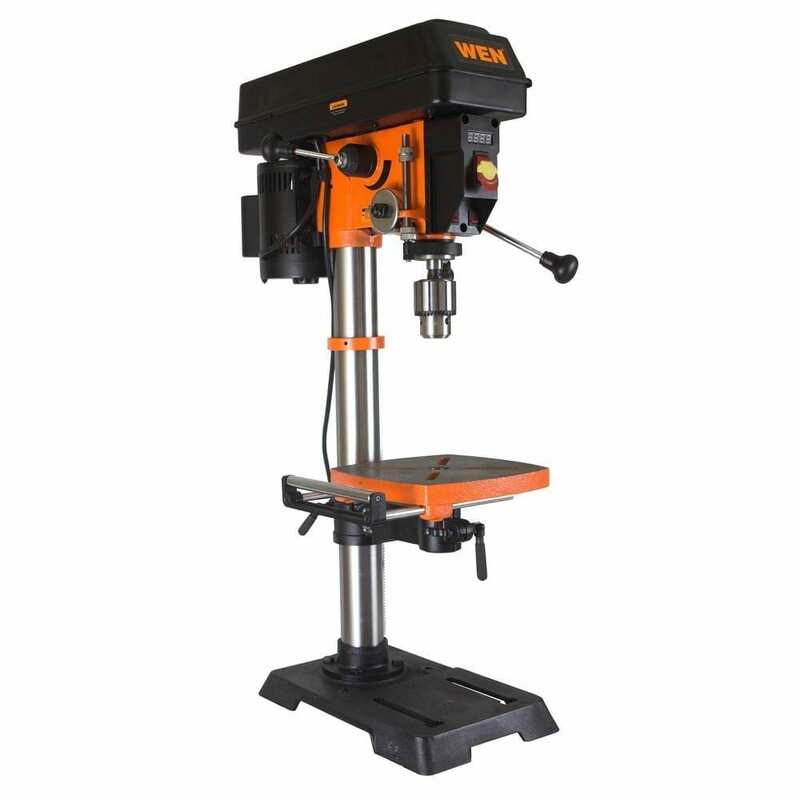 The WEN 4208 is one of the best drill press considered by most users these days. If you want a powerful drill press with a powerful motor that also comes in a fair price, this product is suitable for you. The WEN 4208 features a five pace motor that enables the users to drill through metal, wood, light zinc, iron, aluminum, and even steel. With this kind of tool in your workbench, you can drill various materials with different thickness. You can expect for this tool to do its job even for longer, extended hours because of its durability and versatility. For those of you who want something more for a heavy duty workloads, this can help you a lot. This is also ideal for a budget solution tool you need to acquire for an immediate use. With its powerful motor, the WEN 4208 is capable of drilling even the toughest materials needed to be drilled. It allows its users to comfortable finish the work laid in their table without any exception. This drill press can work as much job put into. For this particular planer, it offers a powerful motor that can endure various workloads that is a great help whatever the kind of your job is. Having a drill press that can be used as a vital tool regardless of the material you are going to drill. This drill is capable of doing drilling jobs for a much longer time even with the toughest workloads presented to it. It does not waver in whatever you throw at it which made it commended by many of the users in Amazon. This particular drill press have an option for selecting the speed for drilling metal. This is another important factor one drill press must have because different materials also need different speed to begin with. This is not only for the sake of the material but also for the safety of the users. A spring loaded pin is used to chuck the key. This compact yet powerful drill press is the perfect tool for your hand-held drill. You don’t need to work manually anymore because this drill press will provide certain advantages which is worth your investment. It allows you to have a perfect and precise drill and will also give you a steady and smooth finish. It is a really essential tool especially if you are already operating on a woodwork shop or any industry shop that requires drilling holes. Overall, WEN 4208 will make the job easier and faster for you compared to when you are still using your regular methods of drilling. The SKIL 3320-01 drill press offers a ½-inch keyed chuck and has a speed of 570-3,050rotations per minute. It also features an adjustable depth stop for accurate measurements and repetitive drilling. The 3.2 Amp motor can press holes through most types of woods and also have an advantage of adjusting the speed. There are 5 speeds to choose from that ranges from 570 rotations per minute to 3,050 rotations per minute. In able to ensure that every hole is drilled exactly where you want it, the depth and angle of the drill press can also be adjusted. For the beginners, this drill press is safe and easy to operate which is a great guide for those who are just starting in this industry. It will help you attend to any of your woodworking jobs and everyday drilling task which can be used easily. SKIL 3320-01 can assure its users that it will last longer than many of other brands in the market today. There is a 5-speed system feature that makes it easier for the users to perform any drilling tasks. The battery operated laser can largely affect the quality of work. Although SKIL 3320-01 is just a small benchtop drill press, it is very much capable of handling a wide range of drilling tasks. It is not only affordable but it will also make it easier for you to finish your projects without wasting materials. The WEN 4214 is known for its high-powered, high-accuracy performance which is suitable for professional woodworking activities. Even if you use this for tough projects, this drill press can stand it even for many years of use. It is very much capable of putting a very precise hole reliably and repeatedly. Speed is one of the most important elements that has to be present in any drill presses. The variable speed allows you to adapt to the material you are drilling. Knowing which speed fits one material or project can be a very vital part in the performance of a drill press. 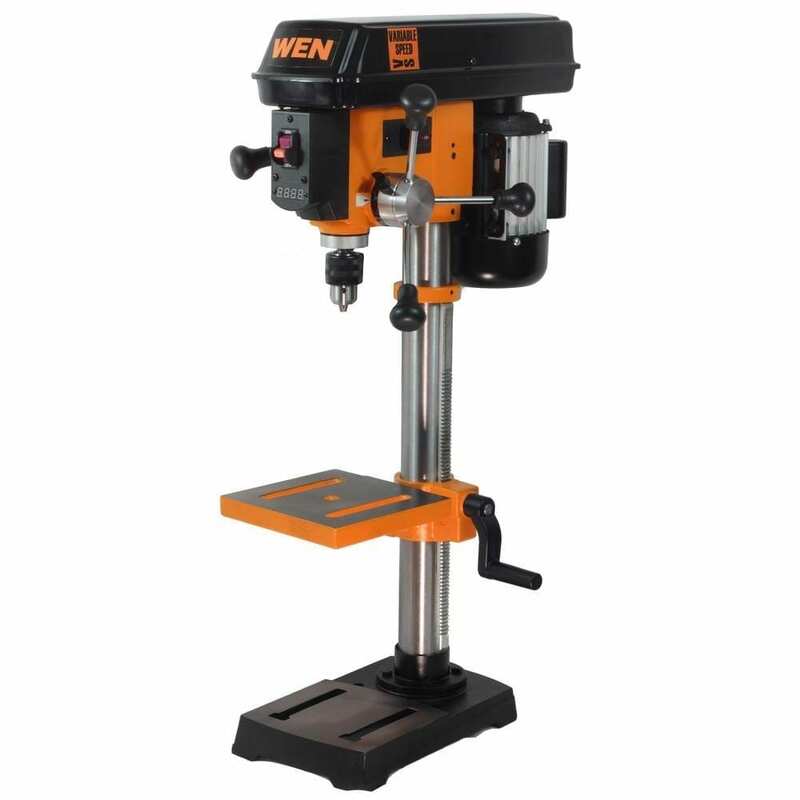 In this case, the WEN 4214 drill press can deliver a variable speed from 580 to 3200 rotations per minute which is allows you to work with different forms of materials. Because of its durable form, the WEN 4214 should last for many years. It is also fairly priced despite its great performance. The component makes it difficult to tighten the chuck well. Compared to other competitive and excellent drill presses, WEN 4214 has a great deal of performance and its price is absolutely reasonable. Especially considering that this drill press has a lot of great features and is durable enough to be used in a tougher works of professionals. This product is highly recommended mostly for drilling wood, especially for a full-time woodworker. This small press is ideal for those who do repairs or a hobby of small DIY projects. Even if this is just a small device, you can get three different speed modes that will work for three different type of jobs. It has a maximum drill capacity of 6mm that comes with 3 wrenches. Practically, this is a good value for small time business and small hole drilling. If you are just new to woodworking or other similar stuff, it is important for you to have at least one tool you can rely on. Many of the users who already purchased the product noted that this tool is a great use for their own small-time businesses. It has a great feature that is very user-friendly. You don’t need to install other parts. You can use right after you remove it from the box. When it comes to accuracy, this drill press is accurate enough to be used in an everyday basis. It also features 3 speeds and the torque is really amazing. Overall, this is a practical and great buy. One customer mentioned that this unit is decent and sturdy. Another customer that as a hobbyist, this model offers the needed assistance at work. Another noteworthy feedback about the model is that it is simple and precise, making it very easy to use. However, it should be noted that there are also some concerns raised by the reviewers. For one, a customer mentioned that the unit is crooked at its 90-degree position. Aside from this, all of the other features are fine enough, with the plunge handle smooth, and adjustments that are easy to make. Overall, this product is a good option to take into consideration. The 4212 offers many features including 2/3 horsepower that can cast iron construction. It is capable of drilling cast iron up to 1 inch thick. Those who are already purchased the product are pleased with its overall quality of the unit. Among its interesting features include a mechanical variable speed that delivers equal torque throughout the range, even targeting the exact RPM from 530 to 3100 with a simple turn of the lever. With its LED display, you can easily read out the speed while using the unit. This unit is designed to power through wood, metal, plastics and more. To have a glimpse of the product, the 4225 has a great appearance making it nice to use and handle. 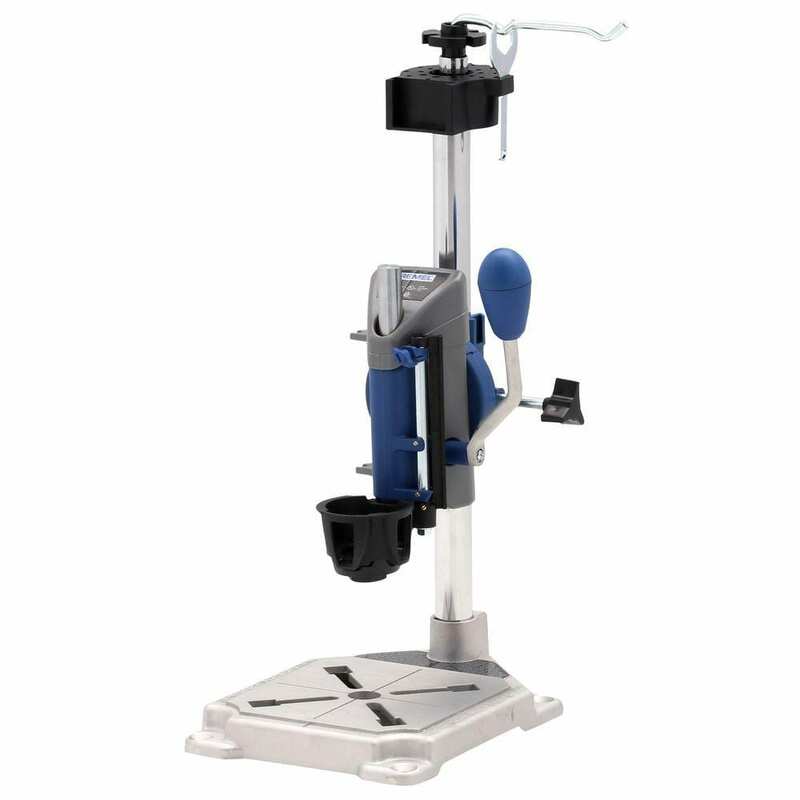 It has 8.6 Amp Variable Speed 15-Inch Floor Standing Drill Press. Its three-spindle design offers twelve speeds ranging between 180 and 2490 RPM. It also comes with a precision laser, onboard key storage, a 5/8 inch chuck, all of which are protected by this model’s two-year warranty. With its available range of speed options, it can easily accommodate hardwood, metal, plastic, softwood, and a whole lot more. As such, this model is used for a wide range of applications. This model is one of the most top rated drill press in the market today. It is equipped with a 3-Amp, 120 volts, ½ HP motor designed to combine exceptional torque and high speed to power the machine to have a perfect drill. With its ½ inch keyed chuck, this unit is ideal for drilling through wood or metal drill bits, as well as sanding drums up to a ½ inch shank. It also offers five settings on speed, ranging from 620 to 3100 RPM. Another interesting feature of this model is the quick belt tension and release, allowing you for a rapid spindle speed change. Its rack and pinion table elevation also allows for easier and quicker adjusting. The HICO-DP4116 comes with great features such as 12-speed setting, heavy-duty 2/3 HP induction motor, 10-inch cast iron. This is a great drill press, especially for newbies. This model comes in a set, which includes cast iron work plate, drill press, ½ inch chuck, chuck key, as well as some assembly tools. It offers 12-speed settings, ranging from 230 to 2800 RPM which helps in accommodating different materials of various thicknesses. This drill’s 45-degree bevel right and left together with its 3.2-inch spindle travel allows this drill press practical and convenient. It comes with an easy rack and pinion table height adjustment, thus avoiding accidental starting. This particular drill press is great with speed, and it also provides enough power and torque for general tasks to occur. Its large base for stability is very useful and very well-assembled. It features a 20-inch press that comes with a powerful 1.5 hp motor. It is also equipped with a smooth-traveling table which raises and lowers at the simple turn of a crank to a position where you need it. It has 12 spindle speeds which range from 150 to 4200 RPM. As such, this model is an ideal choice for home woodworkers and professionals alike. As a bonus, it is also backed up by a two-year year limited warranty. The JDP-17 also has a sturdy cast-iron head for overall stability and premium poly v-belt drive system to ensure its performance always to be smooth and reliable. Out of its full 5-inch spindle travel to its sturdy cast iron head and a poly V belt drive system, you can have the assurance that this model is designed to perform. It also features built-in, long-lasting LED display which provides work light and direct lighting, while also reducing the appearance of shadows. With its huge work table, it offers plenty of support, along with an edge that is designed for easier clamping. 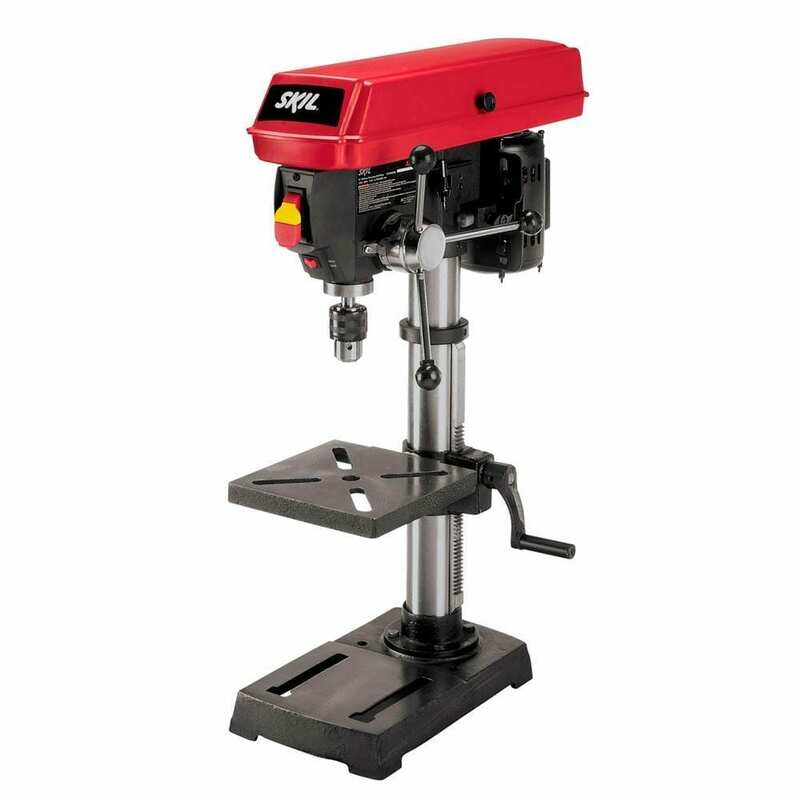 The Shop Fox W1680 17-Inch Drill Press with an overall height of 65-1/2” is suited for an average size cabinet shop or small machine shop. It also has a quick-adjust handle for a comfortable gripping and a built-in light. This model offers solid performance, making it ideal for an average size of the cabinet shop or even a small machine shop. With its powerful and cool running 1 HP motor, it is often referred to as one of the most accurate drill presses under its category. With its precision ground table, cast iron construction, rubber coated handles and sealed ball bearings, you can certainly enjoy the convenience and quality that you want in your machine. This drill press is a 1 1/8 Inch x 2 Inch Capacity Magnetic Drill with heavy-duty magnetic holding power. Includes chuck and adaptor for twist drills up to ½ inch diameter. Other features of this model include a right or left side handles, which means that using this unit is not just easy, but ergonomic at the same time. It even comes equipped with an integrant coolant system which protects the machine from overheating when performing heavy duty task. This machine is ideal for both homeowners/DIYers, or professional contractors. The Klutch 17in. Floor Mount Drill Press is one of the perfect choices for drilling metal or wood. Its features include great power, accuracy, and versatility packed into a sturdy mount base.With its power 1 ½ HP, combined with a 120 V motor with speeds ranging from 600 to 2400 RPM, you can be guaranteed of a model that performs. Among its other features include a depth lock and a ball knob handle that ensures precise adjustments that maintain accuracy. It even comes with a built-in chuck key storage that keeps the chuck very close and easy to locate. An LED light is also added for easier illumination while working. This drill press features a powerful 6.2 Amp and 2/3 HP motor for dependable performance. It also has 5-speed settings for best results in metal, wood, and plastic. This drill is equipped with variable speed control that can easily be dialed into the correct speed requirement while working on various types of materials. Its LED light feature also helps with improving overall visibility, especially when working in darker work areas. The package also comes with a 1.3Ah lithium-ion battery which comes with fade free power, with a battery capacity indicator that displays the available charge. You cannot simply do precise works if you are going to rely on your traditional tools for your different set of projects. There are several drill presses in the market so consider this as the breakdown of reviews from the top rated to the alternative products. These drill presses perform several functions, and you are going to be amazed at how much you are going to accomplish by owning them. Start having your options now and upgrade your tools for a better project soon.